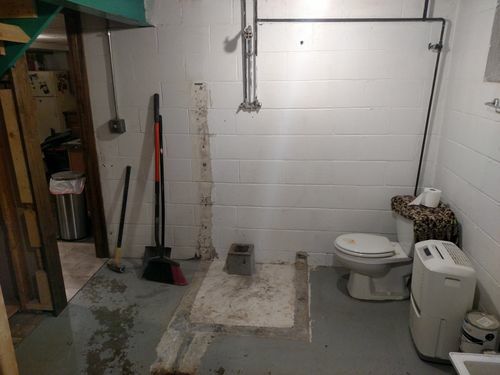 In my last post there were lots of pictures of the footer and foundation, as well as the new roof. Now that is taken care of, we can start prepping to enclose the structure. 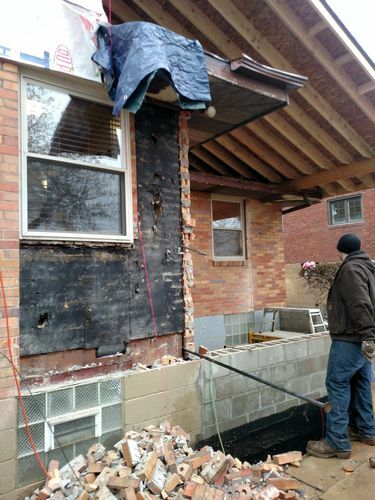 Step 1 is cutting the brick line and removing the exterior bricks. 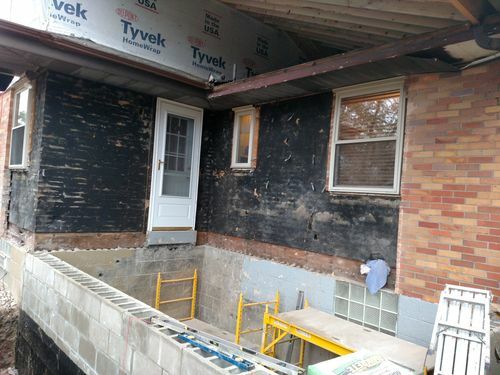 For now, we still have a large clean fill pile in the backyard, so we will be pitching all of the busted brick there for now. 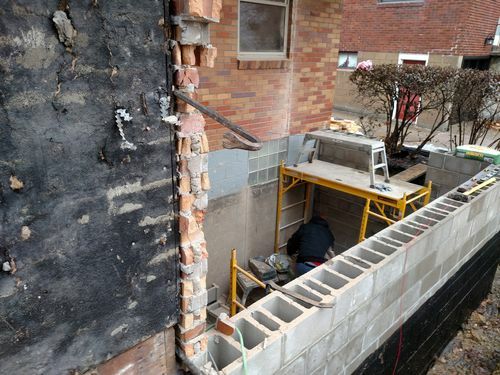 We started with 2 vertical cuts through the brick layer, one on teh left most extent and one to the right. 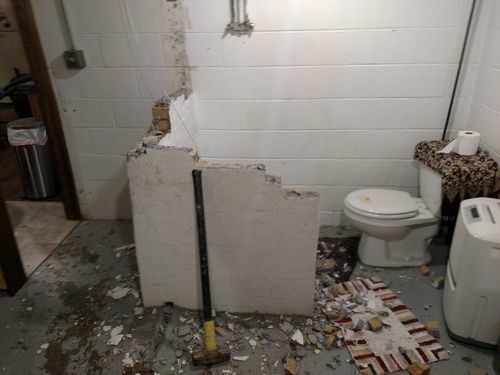 Next we will swinging a sledge to bust up the brick and move it piece by piece. 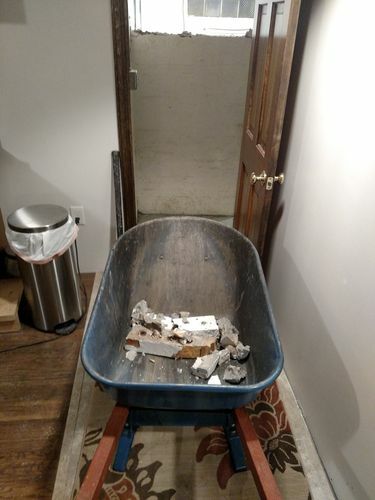 I called a couple buddies to come over and help me swing the Sledge hammer. After a while, 8 lbs gets pretty heavy to swing. 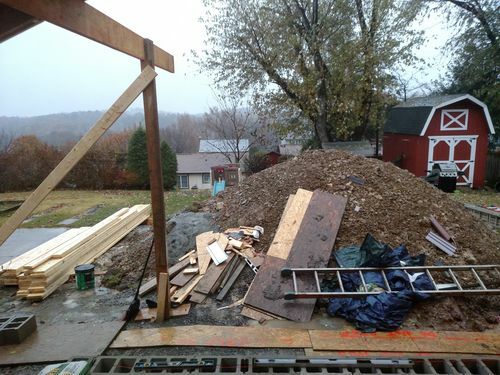 Always nice to know that friends will come over on a rainy 35 degree day to help swing a sledgehammer to bust up blocks and haul them out of a 8’ hole in the ground. Here’s Ryan. He’s normally a Medical equipment sales rep, but moonlights as a pretty good construction worker. Matt is in the bottom of the hole in this picture. He normally sells mortgages and mortgage insurance, but also is a pretty good person to have when needing to move large, heavy things. Progress was slow, but we eventually got there. 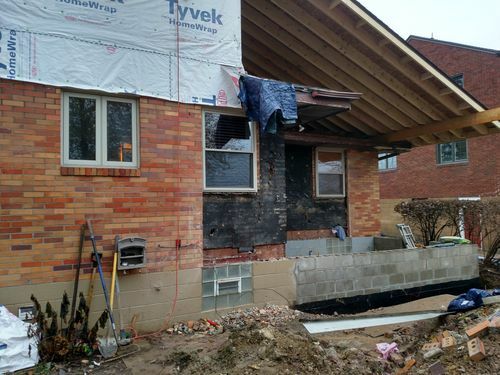 There were little metal brackets attached to the backer-boards, that alternated in between courses and held the bricks up pretty well. Those things made life miserable, especially at interior corner, which we saved till the very end. 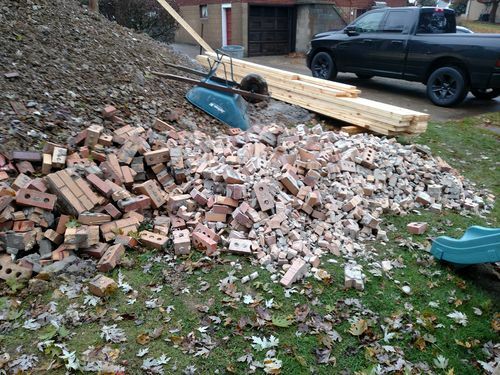 This is only one of the multiple piles of bricks that we ended up with. After a hard Saturday removing bricks, My daughter and I took Sunday to visit the ballet for a performance of the Nutcracker. My wife was slated to go with Meadow, but she woke up with a migraine. Although I appreciate the art of ballet, I can sure think of other ways I would rather spend a Sunday in December, especially when the Steelers are playing…. Anyways, I had to step up and got to spend a great afternoon with my girl. 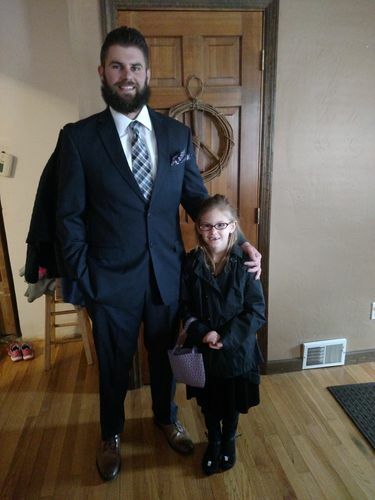 I must say the purple tie really brings out the color of my beard. Later that week is was time to get back to work, this time on the inside. 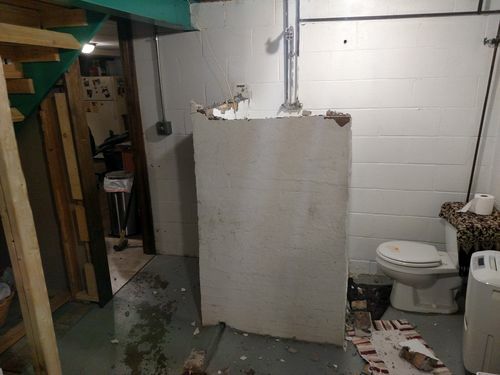 There was an old shower stall built in the laundry room, and it was time for it to come down. 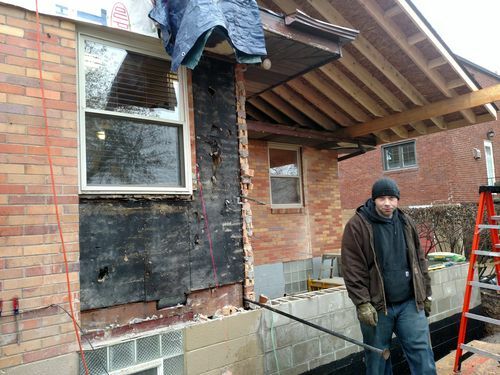 With my trusty sledgehammer in hand and wheelbarrow on the inside of the house, it came down pretty quickly… brick by brick. Always satisfying to seen clean lines after the demo is done. Nice progress! Looking good buddy. Did you have a ear bud to listen to the Steelers game while at the ballet? you have to tear in down to make room for the new. Good progress!! Well after all that work you have scrubbed up into an impresive Dad Just fine! I bet the daughter was chuffed.